ROBsessed™ - Addicted to Robert Pattinson: ROBsessed Quickie: Robert Pattinson is an art critic for fish sculptures and more! ROBsessed Quickie: Robert Pattinson is an art critic for fish sculptures and more! FISH TALES: “That is one hideous fish,” Robert Pattinson remarked as he gazed up at the 5 foot bronze sculpture looming over the bar at Caviar Kaspia. “It’s a sturgeon,” noted Serge Brunschwig, president at Dior Homme, which was hosting a dinner to celebrate the spring 2017 collection it had presented earlier in the day. Pattinson, who was front row and posed for innumerable photos, confessed he was “overwhelmed” by the experience, as hectic outside the venue as inside. He noted it wasn’t his first fashion show, however, since he walked one for Hermès when he was only 12. 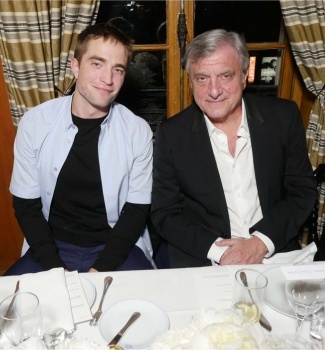 Pattinson, who fronts Dior Homme’s fall campaign, was joined at the event by the faces of the winter spots, including Larry Clark and A$AP Rocky. Labels: a quickie with Rob, afterparty, Dior, DiorRob, fashion show, He's so funny, Paris, Robert Pattinson, Robert Pattinson's modeling days.